The Kansas City Royals had rallied for three runs to tie the score in their half of the eighth inning and Royal reliever Mark Littell, who had not allowed a run to score in the 4 2/3 innings he had already pitched in the 1976 American League Championship Series, was about to face Yankee first baseman Chris Chambliss. My brother Jerry and I were sitting in his living room watching the game and I have to admit, doubts about a Yankee victory were beginning to enter my mind. Chambliss had blistered Royal pitching up to that point of the AL playoff series but as he stepped to the plate, all I could focus on was the fact that the Yankees had not been to a World Series in 12 years. What happened next was one of the most magical moments in the magical history of America’s most successful sports franchise. Chambliss belted Littell’s first pitch, sending it on a high dramatic arch over the padded bright blue right centerfield wall in Yankee Stadium and the Yankees were winners again. New York fans will never forget the complete bedlam that broke out in Yankee Stadium as Chambliss attempted to circle the bases after his historic round tripper. Fortunately, Chambliss was a 6’1″, 200 pound powerfully built athlete enabling him to steamroller his way through the hundreds of fans attempting to pat him on the back, shake his hand, grab his batting helmet, or rip a souvenir piece of clothing or flesh from his body. If Chambliss did not do another thing in his Yankee career, that one at bat would guarantee him a spot on my all-time favorite list of Yankee players. But, in fact, Chambliss was a key contributor on three Yankee pennant winning and two world championship teams. He was the only Yankee player to have at least 170 base hits and drive in at least ninety runs in each of the 1976, ’77, and ,78 seasons and was the calming influence and rock of stability on a team that badly needed calm and stability. In all, he spent six productive seasons as New York’s first baseman during the “Bronx Zoo” years. Born on December 26, 1948, this Dayton, Ohio native came up to the bigs as a Cleveland Indian, capping an effective debut season by being selected as the AL Rookie of the Year for 1971. Chris had three good years for the Indians, but on April 27, 1974, he found himself part of a seven-player trade that made him a Yankee. Chambliss immediately fell into a hitting slump, and batted just .242 for New York in 110 games that first season. 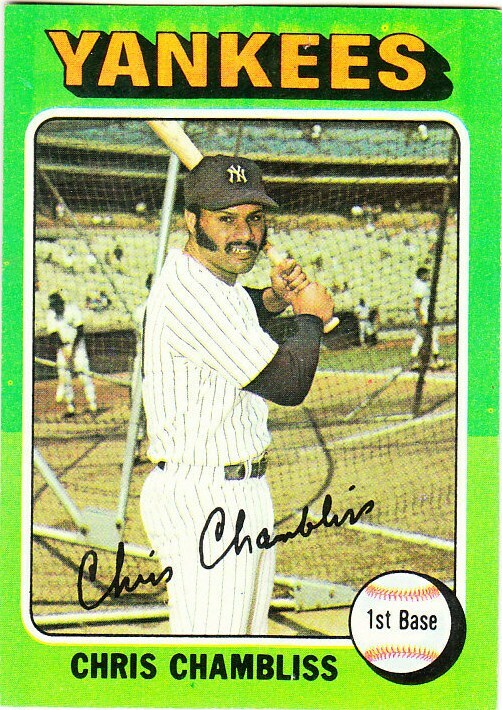 But Yankee fans noticed that Chambliss played hard all the time, and by 1975, Chris had become one of their favorites. Chambliss evolved into a main cog in the middle of a powerful Yankee line-up that included Thurman Munson, Graig Nettles, and Reggie Jackson. Whenever lead-off hitters Mikey Rivers or Willie Randolph reached base, one of the hard-swinging quartet could be counted on to drive them in. Chris was a good contact hitter who didn’t strike out often and his bat regularly produced hard line drives to the gaps of Yankee Stadium. Chris was also an excellent fielder, winning the AL Gold Glove Award in 1978 as the Yankee first baseman. The 1979 season was both disappointing and tragic for the the Yankees. They failed to make the post season for the first time in four years and lost their star catcher and team Captain Thurman Munson, who was killed in an airplane crash. Needing to replace Munson, the Yankee front office traded Chambliss to the Toronto Blue Jays during the 1979 off-season, in a six player deal that brought Blue Jay catcher Rick Cerone to the Bronx. Seven days later, the Yanks signed free agent first baseman Bob Watson to replace Chambliss. About a month later the Jays traded Chambliss to the Atlanta Braves. Chambliss spent the last seven years of his playing career with the Braves hitting line drives and driving in runs, as always. After retiring as a player, Chris ended up back in the Yankee dugout for a while, serving as hitting coach for New York. This one-time Yankee reliever was also born on the day after Christmas.